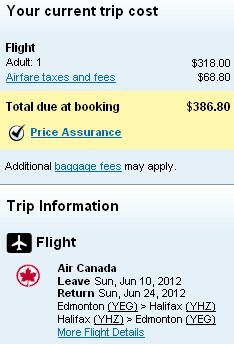 Edmonton to Halifax - $383 roundtrip after taxes - summer travel! These days, prices from Edmonton to Eastern Canada rarely seem to dip too much below $600 roundtrip after taxes, especially for summer travel. However there seems to be a few freak fares in late June in the Air Canada system that are going for nearly 40% less. True discounts (not the marketing nonsense from Westjet or AC) on flights within Canada are extremely rare so I get pretty excited when I see them. Try clicking through to Orbitz to book. If you get a message on Orbitz about the "fare not being available for that itinerary", click on the Select button on the first fare you see, and it will verify (At least, it is at the time of this writing). There seems to be plenty in the $400s, with limited dates in the $300s. edmonton, yeg, flight deals, air canada, canada, halifax, nova scotia, yhz, moncton, new brunswick, yqm, charlottetown, pei and yyg. 6 Responses to "Edmonton to Halifax - $383 roundtrip after taxes - summer travel!" Do you know when this sale ends? It's not an advertised sale, so it's impossible to say for sure. Usually when I see a really crazy unadvertised sale I go with the assumption that it can go away at any moment. Thanks. I better book soon. @Robin: Please see my comment above.